Have you ever seen the musical Into the Woods? It’s a terrific show, and I love it for many reasons. However, my favorite moment of the whole thing is when the witch (of Rapunzel fame) raps about vegetables. Isn’t it funny? Before I started receiving the Local Box, I had never heard of half the vegetables listed in that song. Now, I’ve cooked nearly all of them! That witch would be jealous! Meal one: Apple Cider Braised Greens, Sweet Potato Hash, sliced avocado on the side. Go ahead and substitute the radish or turnip greens from your box for the swiss chard in that greens recipe. The greens taste wonderful, and the radishes or turnips will keep longer if you cut away the greens and store them separately. Meal two: Broccoli, Ginger and Grapefruit Pork Stir-fry. If you think you don’t like grapefruit, you owe it to yourself to try it in a stir-fry with ginger. I have made this recipe several times, substituting slices of drained, extra-firm tofu in place of the pork, and it’s one of my favorite grapefruit vehicles. Don’t skip the fresh ginger– it makes the recipe sing! Meal three: Tuna Pasta Salad with Dill, orange slices on the side. This is one of my favorite recipes from childhood, and it tastes wonderful if you substitute fresh dill for dried, and add 1/2 cup grated radishes to the recipe. I will garnish the salad with sliced green onions, too. Recently on the radio I heard cookbook author Anna Thomas talking about soup, and approximately five seconds after she described her Green Soup, I wanted it. It’s the perfect time of year for greens and onions (the other main ingredient in the soup), and utilizing them both in a soup sounded like a perfect way to spend a slightly chilly afternoon. Not that it is chilly in Austin these days, but those greens won’t eat themselves! It’s not exactly photogenic, but trust me on this one. 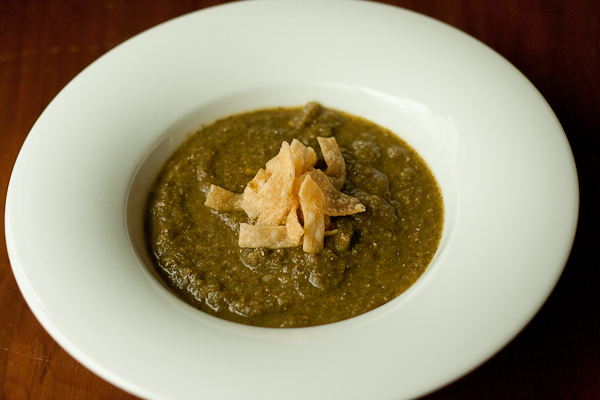 A great thing about this soup is that you can use virtually any kind of green you might have on hand, because even the most bitter greens will be balanced by the sweetness of the caramelized onions. I like the tang brought in by the yogurt, though you can certainly leave that out if you prefer. Serve with pita chips or wonton crisps for a bit of crunch. In a large pot or Dutch oven, heat a swirl of olive oil over medium. Add onions mushrooms and stir to coat. Reduce heat to medium-low and cook until onions take on a nice brown color, approximately 30 minutes. Add stock and increase heat to just bubbling. Wash and chop greens and add to the soup. Reduce heat to medium and cover soup. Let cook until greens have wilted, about 10 minutes. Puree soup and return to heat. Stir in paprika, yogurt, and lemon juice, then season to taste. Alternatively, you can leave the yogurt out until just before serving, and then add a swirl into individual bowls. It’s hard to believe we’re getting this Local Box in the middle of winter! I suppose cauliflower, kale, and butternut squash are winter staples, but the rest of the box feels like a big breath of spring. The cauliflower in this week’s box weighs between 2-4 lbs, plenty for a main dish for four people, or two main dishes for two people. I’m going to use it twice in this week’s menu, and if there is extra, I am going to make Jote’s recipe for sriracha cauliflower as a snack. Meal one: Lettuce, orange and pecan salad, low carb cauliflower leek soup. Watch out for that soup recipe– it easily serves 12 people! Use the recipe calculator function on the Allrecipes website to scale down the portions for your family. Also, since there haven’t been leeks in the Local Box for weeks now, I will substitute a finely chopped yellow onion for the leeks in that recipe. Meal two: Cauliflower tomato curry with pita bread and avocado hummus. That avocado hummus tastes great if you use lime juice instead of lemon. When you chill the hummus in the fridge, make sure to put a layer of plastic wrap directly on top of the avocado mixture to help keep it from turning brown. Meal three: Chicken and Rutabaga Stew. I am going to live adventurously and add peeled, chopped daikon radish to this stew. Daikon cooks very much like turnip and other root vegetables, so I think it will fit right in here. This stew tastes great served over bulgar wheat, couscous, or brown rice. Meal four: We’re doing breakfast for dinner this night, with butternut squash breakfast bowls. Just looking at the pictures of that breakfast bowl makes me crave poached eggs and kale together. YUM! Roasting the squash for that recipe will take some time, so you can do that step ahead of time if you wish: just peel and dice the squash and bake it at 350 for 30-40 minutes until it is tender. Store it in the fridge until you’re ready to make dinner. Now that it is beet season again, I’m more determined to if not like the darn things by themselves, to at least find ways of incorporating them into foods I do enjoy. And, of course, I enjoy chocolate. What food blogger doesn’t like chocolate, right? Beet brownies aren’t a new thing, but that doesn’t mean I can’t be proud of them. Plus, these are gluten-free, so I know I can feed them to my friends without having to worry about dietary issues. I’ve found that garbanzo bean flour to be really reliable for me in the gluten-free department – it has worked well for cornbread, cookies, and now brownies. 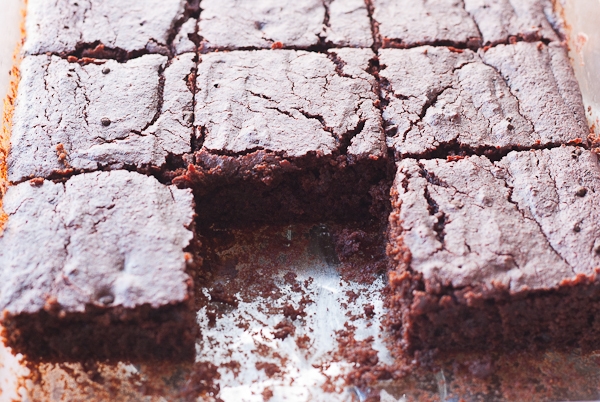 These did end up a little more cakey than I had expected, so if you like a more fudgey brownie, use a bit less flour. You’ll notice that I included gram measurements for the chickpea flour and cocoa. This is due to differing scoop methods – I’ve been burned in the past with recipes that only list a cup measurement, so I have decided to be more precise when it comes to my flour measurements on posts. If you don’t have a kitchen scale, they are extremely affordable and perhaps the best tool you’ll add to your arsenal. Trim long roots and greens from beets and clean off any dirt. Dice them into quarters (or smaller, depending on the size of your beets) and set in a pot of water to boil. Boil until easily pierced by a fork, approximately 30 minutes. Drain and let cool until they are comfortably handled. Meanwhile, melt chocolate in the microwaves at 30-second intervals. Whisk until smooth and completely melted. Set aside. In another bowl, melt the butter in the microwave, and set aside. Once the beets have cooled, the peels should slip off easily. Place peeled beets in blender or food processor and puree until smooth. Preheat oven to 350 degrees and grease a 9×13 baking pan. In a medium bowl, mix together flour, cocoa, baking powder, and salt, and set aside. In a large bowl, whisk together beets, chocolate, and sugar. Beat in the eggs, and add the vanilla. Stir until smooth. Add the flour mixture to the large bowl and stir until well-incorporated. Bake for 30 minutes, or until a toothpick inserted into the center comes out clean. Let cool as much as possible before cutting. Great the first day, better the second. Oh boy! There are mustard greens and spinach coming in this week’s Local Box! I have been waiting for this combination of greens all winter to make Sarson Ka Saag, a wonderful and spicy Indian curry, served with roti or naan. My family usually turns up their nose at mustard greens, but the heat and texture of these spicy greens is just perfect for Indian preparation. We will definitely be having that dish on Wednesday night when our Local Box arrives! Meal one: Sarson Ka Saag (Mustard Green Curry) with Naan and jasmine rice. This dish calls for Mustard Greens and Spinach, but you could definitely substitute the Mizuna/Komatsuna for the Spinach if you wish. Chopping the greens very fine, with a food processor if you have one, is key to the creamy consistency that makes this curry sing. Meal two: We’re only getting 7 or 8 crimini mushrooms in the Local Box, so they’ll definitely need to be paired with something else to make a full dish. I’m going to try this Roasted Butternut Squash with Green Onions and Mushrooms, along with some local, organic link sausage as the main dish. Meal three: This wilted lettuce salad is to die for, and I think its flavors would really compliment French Onion Grilled Cheese Sandwiches. If we don’t eat all the tangerines for snacks during the week, I’ll serve those on the side for dinner. Meal four: Wok sauteed mizuna with minced chicken. If we get cabbage, I’ll grate the whole thing and cook it along with the mizuna in this recipe, making sure to double the liquid ingredients in the recipe so that there’s plenty of sauce. Bonus: I can’t figure out a good way to use the mint in any of the dishes above, so I’ll probably use it to make mint ice cubes. Mint ice cubes are super easy, and a great incentive to drink more water during the day! Happy New Year! The new year brings lots of first-time cooks to the Local Box Blog, so we’re going to focus on easy recipes in this month’s meal plan. I qualify “easy” recipes as those that take 30 minutes or less of hands-on time to prepare. Easy recipes also use basic pantry items and common kitchen tools– nothing too expensive or tricky to procure. As always, I’ll include some tips and ideas for making substitutions in the linked recipes. Please leave questions and suggestions in the comments! Meal one: A big salad made with chopped lettuce, a handful of chopped tender greens, 1/4 cup chopped spring onion tops, a can of chickpeas, and sliced radish. This grapefruit vinaigrette looks easy to make since the grapefruit juice can reduce while I am chopping vegetables. Meal two: Chicken with Sweet Potatoes and Shallots. Slice the white parts of the green garlic or spring onion and substitute for the shallots in that recipe. Meal three: I’ll use bacon, which I have on hand, instead of salt pork in this recipe for turnip greens with turnips. I’ll also add one chopped yellow onion during the first step of the recipe. That recipe takes about 90 minutes to prepare, total, but only 20 minutes of that is hands-on time. On the side, I’ll serve orange slices. Meal four: Pasta with caramelized onions and brussels sprouts. I’m skipping the bacon in this recipe– the meal should cook up fine without it if I use 2 tablespoons of olive oil and no bacon grease to saute the veggies. I’ll substitute a thinly sliced yellow onion for the shallots in Martha’s recipe. I always feel a little sad around this time of year. The day has come to toss the half-empty bottles of champagne and leftover snack foods from the fridge. Starting today, I will wear my yoga pants for yoga practice, and not for waistline-expanding feasts of plenty. The time for holiday gluttony has passed. Luckily, my friend the sweet potato is here to console me. These winter root vegetables are my go-to comfort food in January, since they’re easy to prepare and figure friendly. 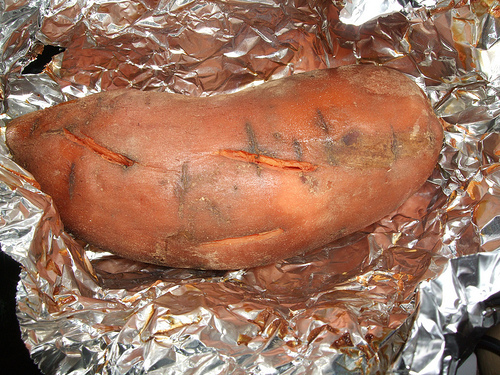 Plus, if you’re really desperate for that festive feeling, you can unwrap the foil-covered sweet potato like a present. If you pair a baked sweet potato with high-protein toppings and a side salad, it’s a complete weeknight meal. Usually when I serve baked sweet potatoes as a dinner entree to my family, I let each person choose his own toppings to really personalize the meal. I set out several possible toppings buffet-style on the counter, and everyone can go to town. This is a strategy is a great way to clean out the fridge if your condiment stash is out of control, too! Scrub each potato under running water and then pat dry. Wrap each potato in aluminum foil. Place in the slow cooker and cook on low for 4-6 hours, until potatoes are completely tender. Check the doneness of the potatoes by sticking one with a skewer: if it slides through the whole potato with ease, the potato is done baking! Unwrap the hot potato and cut open before topping with the goodies of your choice. What are your favorite sweet potato toppings? Let us know in the comments!